PPC Partner Plus Consulting, Inc. was founded in 1998 in response to a need in the industry for claims administration services. PPC staff has many years of experience in healthcare claims, including healthcare claim review and management, for insurance carriers, third party administrators and the managed care industry. PPC's services include: Healthcare Claim Reviews, Self-Funded and Insured; Pharmacy Reviews; Outsourced TPA Internal Quality Reviews; Implementation Reviews, Stop Loss and Reinsurance Reviews; Premium Accounting Reviews; Overpayment Identification and Recovery; Acquisitions and Mergers - Operational Due Diligence; Operational Reviews - Process and Procedures. We are not benefit consultants. 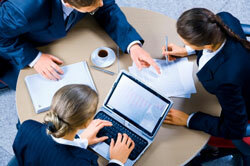 Our primary focus is to perform claim management services for our clients. PPC is DBE (Disadvantaged Business Enterprise) certified and SBE (Small Business Enterprise) certified by NCTRCA (North Ventral Texas Regional Certification Agency) and is HUB (Historically Underutilized Business) certified by the Texas Comptroller of Public Accounts. We have significant experience in conducting claim reviews of major insurance carriers, managed care organizations, and third party administrators. Our reviewers are experienced in reviewing all types of plan designs, including HSA, HRA, CDP, HDHP, EPO, POS, PPO, HMO, Indemnity, Mental Health, Dental, Vision and Pharmacy. PPC Partner Plus Consulting has an excellent reputation with its clients and is pleased to furnish references upon request. � PPC Partner Plus Consulting, Inc. All rights reserved.